Elizabeth helped me put up some photos of my first year so you could look through my album, too, if you’d like…. That got me thinking about my roots. Elizabeth is a genealogist, so she said she’d help me look into them and pass what she knows on to my reading public. 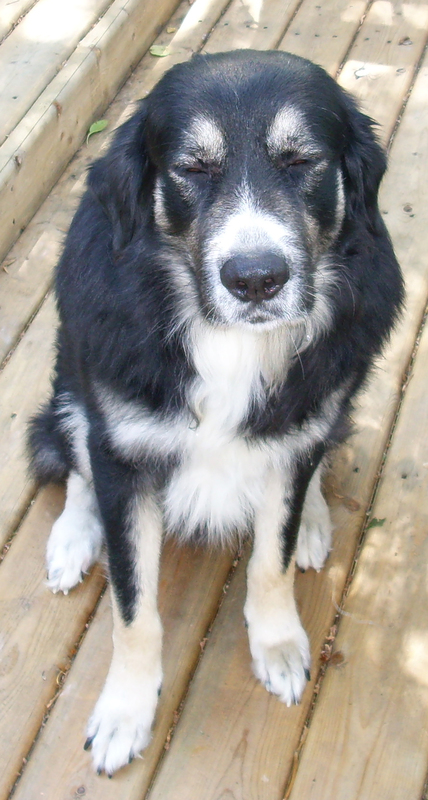 I was born on 22 Aug 2009 in Vita, Manitoba to a purebred Great Pyrenees mother and a father who was half Newfoundland, half Great Pyrenees Mountain Dog. Elizabeth tells me that they lived together in the same house for a long time. 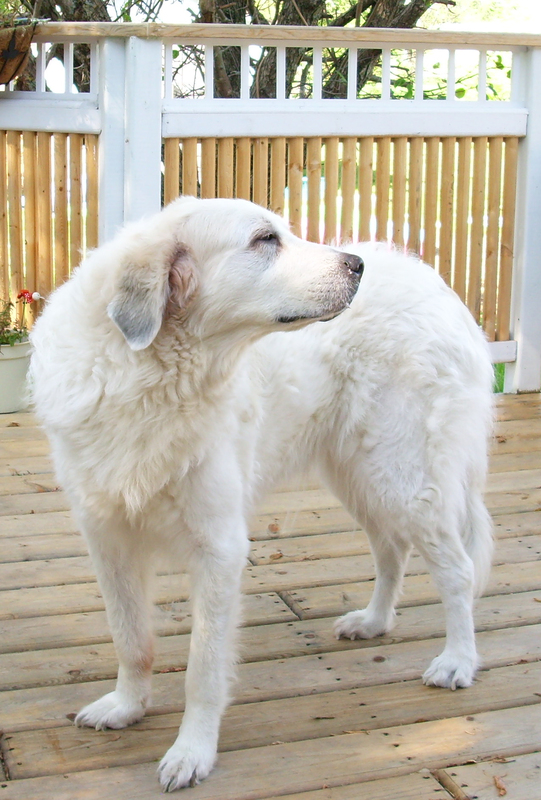 Before I came along, my dad fathered a litter with a Great Pyrenees gal who belonged to a neighbour – not my mom! 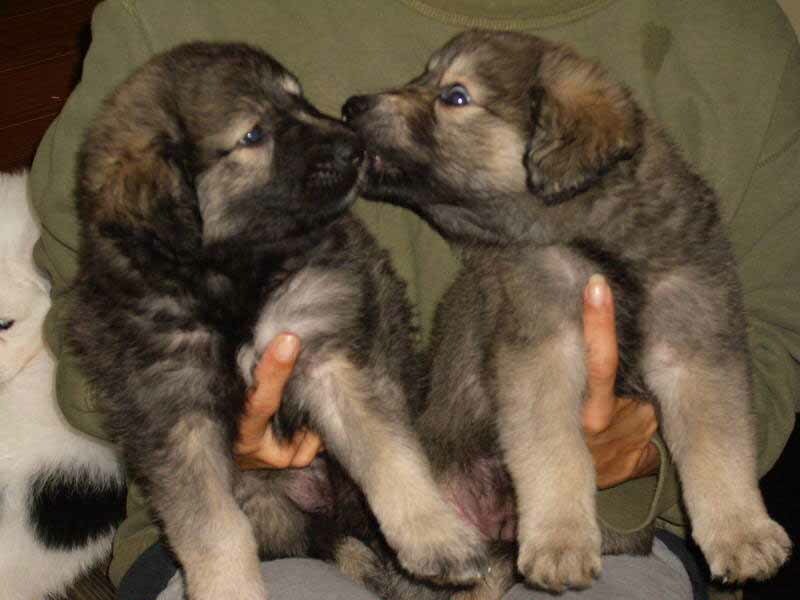 – and that my mom’s two-leggers liked the puppies so much that they decided to let my mom have some, too. I don’t remember exactly how many brothers and sisters I had. There were a lot of us, Mom and Dad and my 8 month old half-brother. He was white with black patches and even at that age could touch the top of the sliding patio doors when he stood on his hind legs. Dad didn’t like us pups much; he’d growl at us if we got too close. Not that we cared that much. Elizabeth said that when she came to pick me up there were about twelve puppies left to choose from. We were too busy tearing around the house to care about what those old farts thought of us! But I missed them, particularly Mom, when I went to my new home. Elizabeth says she found me on Kijiji, a buy/sell site online. She was looking for a puppy within a certain price range. She saw a photo of two of my sisters and asked my parents’ two-leggers to keep one of them until the pick-up date. She says that when she got to Vita, the people had sold the puppy she’d asked for. She was pretty ticked off, but she didn’t say anything. She’d come so far – about 300 km, so, she decided to look at the rest of us to see if she could love one of us who hadn’t been sold yet. Kijiji Ad Photo - Elizabeth originally asked for the pup on the left, but she left with me! Elizabeth pulled me out from under the chesterfield and, somehow, she knew that I was the pup for her. She had brought a blue collar with reflective threads for me, and my very own leash. None of my siblings had a collar. I felt very grown up with it, and she says I strutted around the room like a silly flapper [Ruffed Grouse] on a birch branch, showing off to all my brothers and sisters. One of my jealous sisters waited ’til I started snoozing beside Elizabeth to try to steal my leash, which was draped over an Ottoman. We had quite a tug of war. I won, perhaps because the leash was attached to my collar, but I think I would’ve won anyway. I thought Elizabeth was all right, too, and I’m kinda glad my other sister was gone, even if Elizabeth says she would have changed her mind and taken me if the other puppy had still been there. It just wouldn’t have been right any other way than the way things turned out. All the long drive home I either slept on her lap or under her sitting place in the car. I felt safe with her, except when she took me out on some grass to do my business. I’d never seen or felt grass before, or the ground. It felt very strange compared to the floors in the house where I’d spent my whole life so far! But I got over my uneasiness the more I explored the world around me. There’s so much more to experience here than there was in my first home! She also had a new friend for me, Squirrelly. She says when I wasn’t looking, she rubbed all my family with Squirrelly so I could still smell them when we were gone. You can see a photo of us together in my album – the very first photo. I’ve never since seen my parents or any of my siblings, but Squirrelly remains my best buddy ever to this day. Except he’s hibernating somewhere just now…. I’ll find him again in the spring.